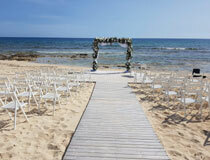 Detailed below is a selection of truly romantic beach settings in Cyprus, perfect for a sand-between-your-toes ceremony. 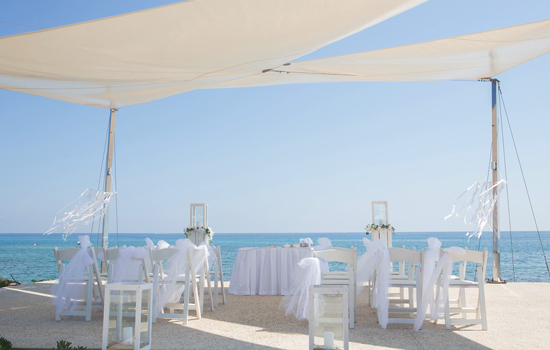 And with our huge choice of beachfront hotels in Cyprus, wedding venues with a sea view backdrop are plentiful... and some also offer you the chance to experience a beach wedding! 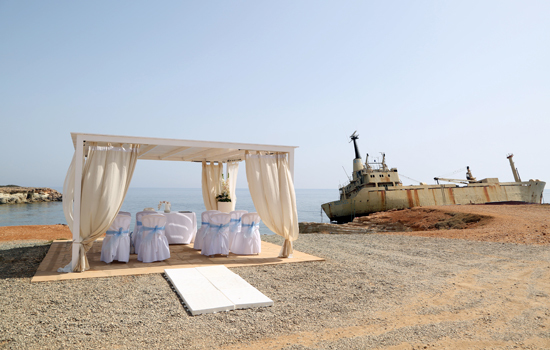 Very nicely put together by the municipality of Peyia, this purpose-built wedding venue stands right by the waterfront in Gliki Nero Bay, an area also known for its sea caves. 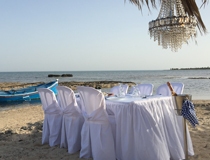 What adds further interest to this magical sea view setting is the fact that it is located next to the Edro III, a Sierra Leone-flagged ship that has remained stranded on the rocks since it ran aground in 2011. 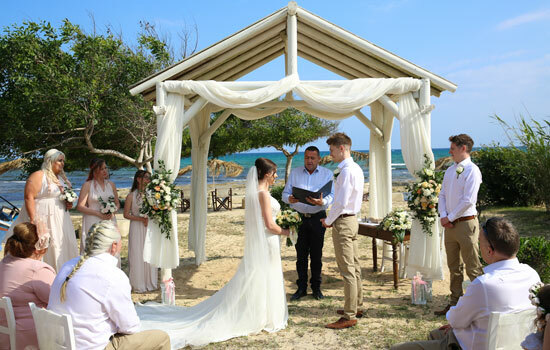 The wedding gazebo can sit about 30 people and the one-hour use allows all the time required for the Peyia Marriage Officer to conduct your special ceremony and enjoy posing for photographs afterwards. 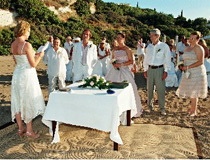 As an extra touch, a table can also be laid out with drinks to toast the happy couple after the ceremony. 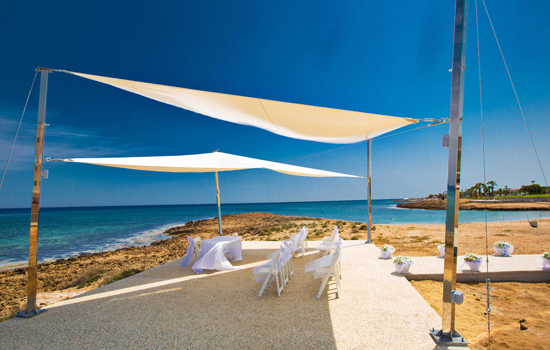 The Aphrodite Beach venue is a stunning location for anyone who chooses to marry in Ayia Napa. 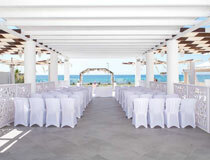 It is an exclusive venue, not attached to a restaurant and there are no sunbeds on the beach either! 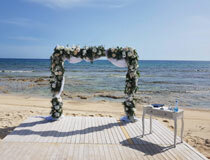 And as Aphrodite Beach only offers one wedding per day, you are guaranteed to be made duly special on your special day. 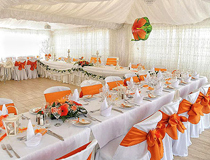 Weddings are conducted under the purpose-built pavilion, a charming set up that can be decorated to your wishes. 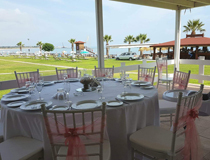 There is also a marquee that faces the sea and accommodates from 20 to 100 persons. 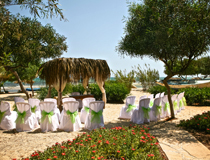 This is where your barbecue reception can take place (various menus are available) before your party dances the night away on the dance floor. 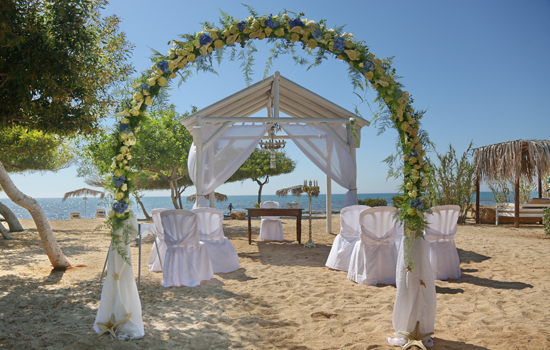 Worth noting is that a couple of the 'packages' available at Aphrodite Beach include all the decorations for the reception marquee. 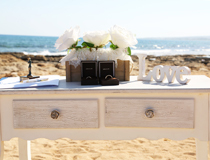 Amongst other intersting special touches that can be organised on your behalf is a 'chill-out' area, perfect if you wish to serve champagne on ice to your guests. 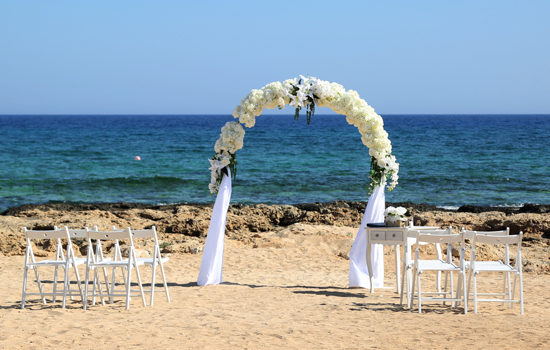 Located a few miles from Ayia Napa, the municipality of Sotira features as one of our latest gorgeous locations where we are able to organise beach weddings. 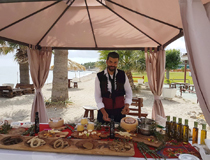 Indeed, this area is blessed with a wonderful coastline where turquoise waters lap breathtaking beaches including Sirens Beach. 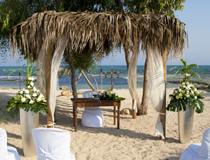 We can put together a variety of packages and 'dress' these beautiful beach settings according to your wishes and your budget. 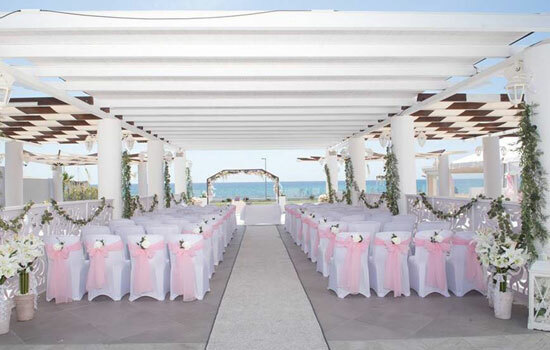 Of course, we'll also be able to suggest where you could hold your reception, no matter how many guests you have invited to share your special day. 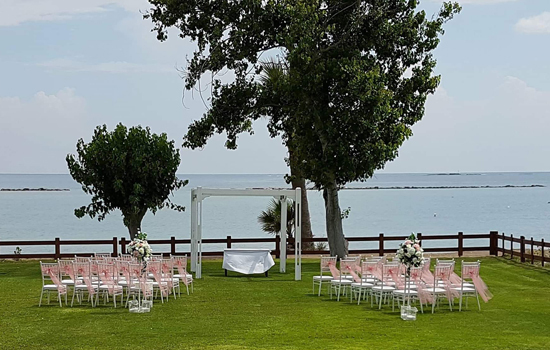 Always keen to respond positively to public demand, the 'wedding team' at Paralimni Town Hall has found a perfect beachfront location for wedding ceremonies in the Pernera area. 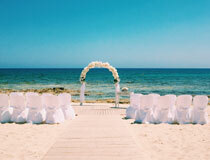 Indeed Pernera Blue Waters is a true sea view wedding venue and to ensure comfort for all (and save your shoes! 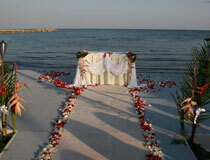 ), a large and shaded platform where the ceremony is conducted has been erected on the beach. 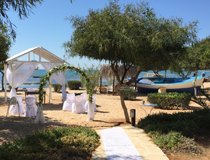 Not everyone fancies getting married in a hotel and would prefer to have the chance to experience a less formal setting for their special day, yet without compromising on a stunning location. 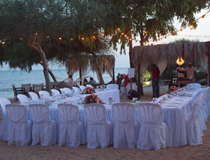 Atlantida Restaurant is a perfect and very relaxed wedding venue option in Paphos and situated a few paces from the sea. 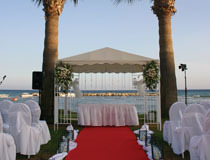 Here the ceremony takes places under a pretty gazebo in a grassed area by the waterfront. 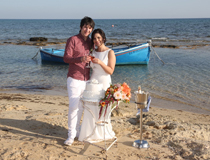 Lots of opportunities for gorgeous wedding photos while your guests mingle with a few drinks. 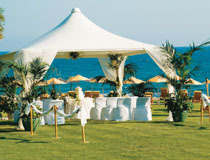 Then, just walk across the lawn for your reception at the taverna. 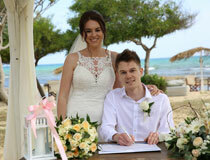 We'll discuss with you the choice of menus available, we'll add music entertainment if you so wish, we'll get the tables decorated to follow your colour scheme... we'll help you plan the very best day of your life! 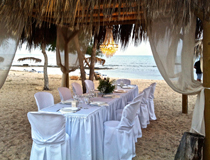 Atlantida Restaurant is featured as our special 'beach wedding' package. 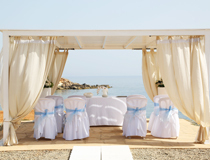 Whilst the vast majority of the hotels we feature as wedding venues in Cyprus give you the opportunity to have your service conducted outdoors with a beautiful sea view backdrop a few paces from the waterfront, some also offer ‘beach weddings’ settings for that true ‘sand-between-your-toes’ ceremony you might always have dreamt of. 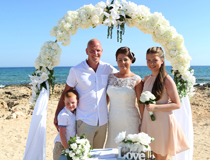 We could also suggest a lovely seafront location for your wedding to take place on a beach in the Coral Bay area. 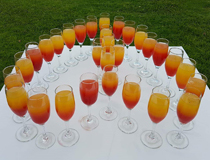 If any of these options sounds just like what you have been looking for, call us to discuss how we can turn your dream into reality.